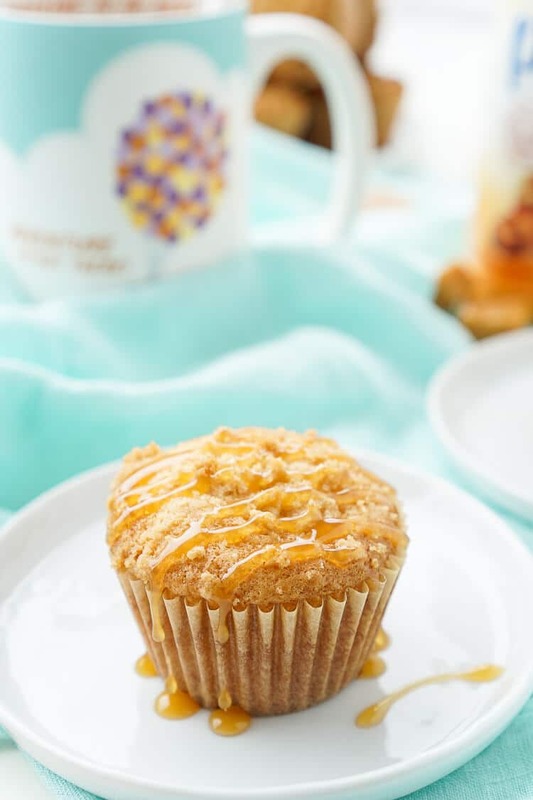 These Caramel Muffins are the perfect pairing with your morning coffee. They’re simply sweet with a gooey caramel center and a crumble topping, you just can’t go wrong! Guys, most of the world is doing something VERY wrong. They’re not serving up caramel muffins in cafes and enjoying them with their morning mug. Wrong I tell ya, just plain wrong. But here’s the thing, until my most recent trip to Iceland, Caramel Muffins had never even crossed my mind, but they’re everywhere there and I want to make them a thing back here! FOLLOW SUGAR & SOUL ON PINTEREST FOR MORE RECIPES! I mean, caramel is such a common flavor here in the states and with salted caramel all the rage the last couple years, how come when you google search “Caramel Muffins” hardly anything shows up, and when it does, it has apples in it. Caramel deserves its own time in the light, no more being a sidekick to chocolate, apples, and whatever else. It’s time for Caramel to shine, don’t you agree? Good, I’m glad, now go make these muffins! These muffins have a rather simple base with a fun surprise. 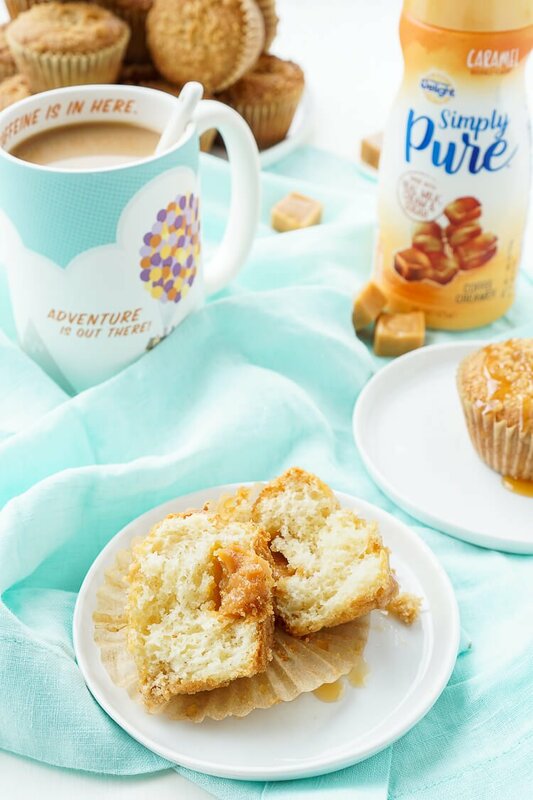 The batter is made with International Delight Simply Pure Caramel Creamer and basic pantry staples, then a caramel chew is inserted into the center of the muffin before baking so you have a gooey center once they come out of the oven. Oh, and did I mention the brown sugar crumble topping and the drizzle of caramel sauce, yeah, let’s not forget that! Since I’ve been home, it’s been all about getting back into a routine. Luckily I didn’t have any jet lag, in fact, my time in Iceland seemed to reset me from when I was all messed up after my trip to the west coast last month. I guess I just need to counterbalance every trip with another one, ha, my husband would kill me! But even though my biological clock seems to have been set right, there’s still that whole work thing and I had to hit the ground running this week. I’m so thankful for my life planner, breakfast, and caffeine because, without them, I’d be lost. 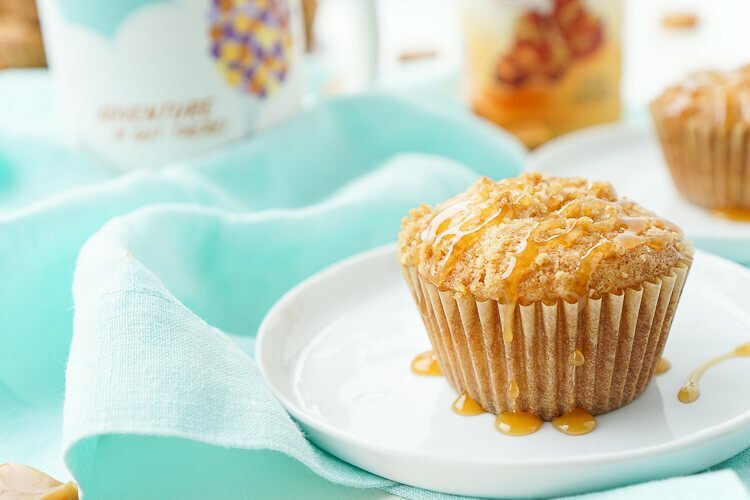 These Caramel Muffins are the perfect pairing with your morning coffee. They're simply sweet with a gooey caramel center and a crumble topping, you just can't go wrong! Preheat oven to 400 degrees F. Line muffin pan with liners and set aside. In a large bowl, stir together the flour, sugar, baking powder, and salt, and make a well. In a medium bowl, beat egg lightly, add creamer and vegetable oil and beat until combined. Pour wet ingredients into the well of the dry ingredients and mix gently just until combined, do not overmix, it's okay if the batter is slightly lumpy. Add 2 tablespoons of batter to each liner, place an unwrapped caramel in the center, top with another tablespoon of batter. Repeat for the remaining liners. Mix topping ingredients together with a fork in a small bowl until crumbly, sprinkle over the top of the muffins and bake for 20 to 25 minutes until golden brown. Drizzle with caramel sauce before serving if desired and use caution as caramel center will be molten after removed from the oven. Bake off remaining batter the same way. Thanks so much, Silvia! That sounds like the perfect morning start to me! Now I want caramel muffins! Cupcakes are usually too sweet for me so this looks perfect. 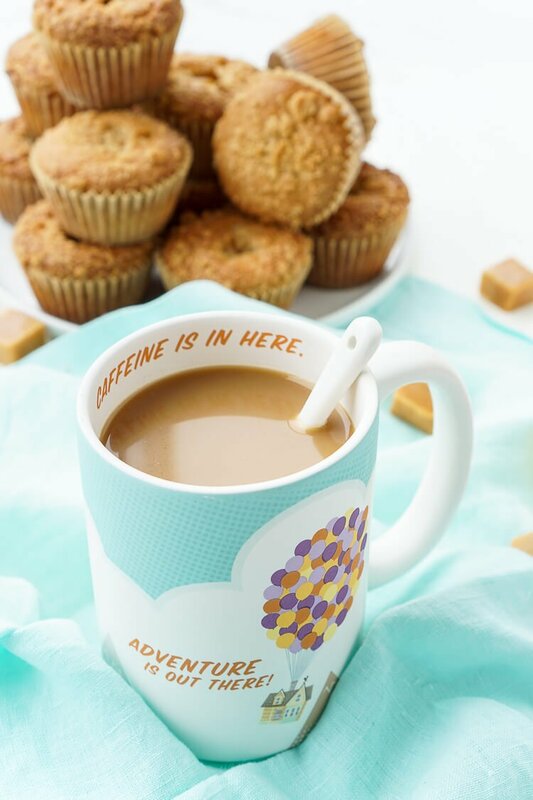 Plus that mug is super cute! Thanks so much, Matt! I hope you get a chance to try them for breakfast real soon! 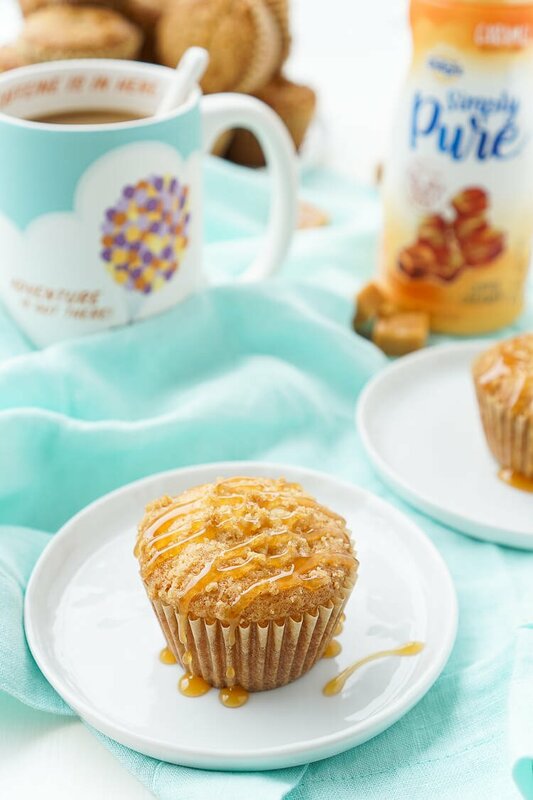 I am all for more caramel and these muffins would go perfectly with my morning coffee! I agree, caramel is so often a secondary flavouring to other ingredients. I’ve not come across caramel muffins before, though I wonder if they’d be similar in flavour to toffee cake, a recipe I come across now and again here in the UK, often in traditional tea shop type cafes. If your muffins have a similar flavour, I know I’d love them! Caramel muffins. Why didn’t I think of that? Nicely done! I know, right! I can’t believe they’re not in every bakery! I love using coffee creamer in my baked goods, it ads such a richness! Starting my day with this muffin would make for a wonderful start to the day! Wow! So creative! 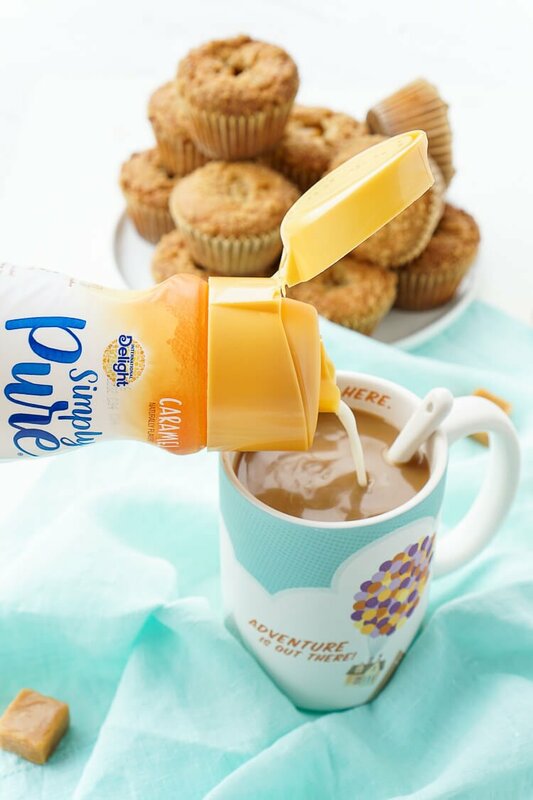 I don’t think I would have ever thought of using creamer in muffins! It’s the perfect substitute for milk or water and adds so much extra flavor! Oh yes! What a special treat to make for breakfast! Absolutely Delish! I made these for Halloween. The use of the creamer was brilliant – it really kicked up the flavor. I left off the topping, and instead, took the muffins out of the liners and dipped them in homemade salted caramel sauce. Even those who don’t like caramel loved it (though I’d likely exclude the caramel squares for the more fussy ones). Thank you for sharing. I look forward to trying more of your recipes. I’m so glad you enjoyed it, Joanna!